Cabo San Lucas, Mexico, Dec. 20, 2016 – Diamante, a 1,500-acre private resort that fronts the Pacific Ocean in Cabo San Lucas, has debuted The Oasis Short Course, a brilliantly conceived 12-hole layout designed by superstar Tiger Woods and TGR Design. Two years after he unveiled El Cardonal, a playable yet challenging 7,363-yard layout with an “Old California” design motif that marked his architectural debut, Woods, alongside baseball legend Roger Clemens, played the inaugural round on The Oasis Short Course. The versatile design features 12 enticing par 3’s ranging from 41 to 143 yards. The course can also play as a three-hole course featuring a 374-yard par 4, a 143-yard par 3 and a 540-yard par 5. Each layout can be played in about an hour. The Oasis Short Course occupies the site of the former 12th and 13th holes on the Dunes Course, the club’s internationally-ranked course by Davis Love III. These inland holes, routed around an attractive water feature, were an ideal place to build a family-friendly design that will appeal to golfers at all ability levels, from novices to experts. Noting that there’s only one forced carry on The Oasis Short Course, Woods said a putter can be used from nearly every tee, as he and Clemens demonstrated during their exhibition round. “My favorite courses are links courses where golfers can use the ground as a friend and an ally,” Tiger explained. “Players here can use the slopes and contours to guide the ball to the target.” Woods, like many other golf industry leaders, believes too many modern courses are too difficult to play. His comments were echoed by Diamante owner Ken Jowdy, who explained that the park-like atmosphere of The Oasis Short Course was conceived as a “green space” for a variety of recreational pursuits, from golf and croquet to beanbag and Frisbee tossing. Jowdy said a nominal fee for a week’s access to The Oasis Short Course will be established for Diamante members and their guests. He added that free club rentals are available to men, women and juniors. Unlike the Dunes Course and El Cardonal, which are surfaced in paspalum, fast-running Bermudagrass was used to surface The Oasis Short Course from tee to green. “The new short course is a preview of The Oasis Course, a lushly landscaped 18-hole design by Tiger Woods and TGR Design that’s now in the planning stages,” Jowdy stated. 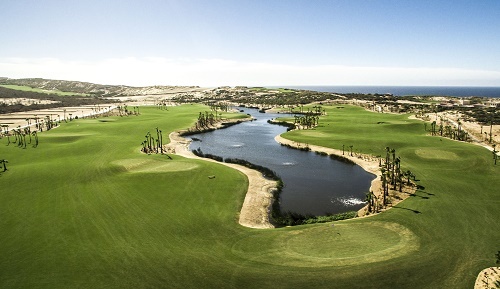 The Oasis Short Course at Diamante is the 15th course to open in Los Cabos, which has been named the ‘Latin America & Caribbean Golf Destination of the Year’ for 2017 by the International Association of Golf Tour Operators (IAGTO) in recognition of its exceptional golf courses and unique mountain-desert-ocean ecosystem. Situated at the tip of the 1,000-mile long Baja Peninsula, Los Cabos is home to award-winning hotels, resorts, championship golf courses, rejuvenating spas and world-class sport fishing. With a unique landscape of dramatic desert and dazzling beaches, Los Cabos is an exotic escape favored by celebrities, couples and families within easy reach of most U.S. and Canadian cities. For more information, images and videos from Los Cabos, visit www.visitloscabos.travel, follow us on Twitter @LOSCABOSTOURISM and visit us on Facebook, YouTube, Pinterest and Instagram.